4Videosoft M2TS Converter is designed to convert M2TS to MKV, MP4 AVI, etc. for iPad, iPhone, iPod, Samsung Galxy S4, Samsung Galaxy Note 2 and other Android/Windows devices. Besides, it allows you to convert MTS, TS, HD MPG, HD MPEG, HD MP4, HD WMV and other SD(Standard-Definition) videos to the video formats what you need. 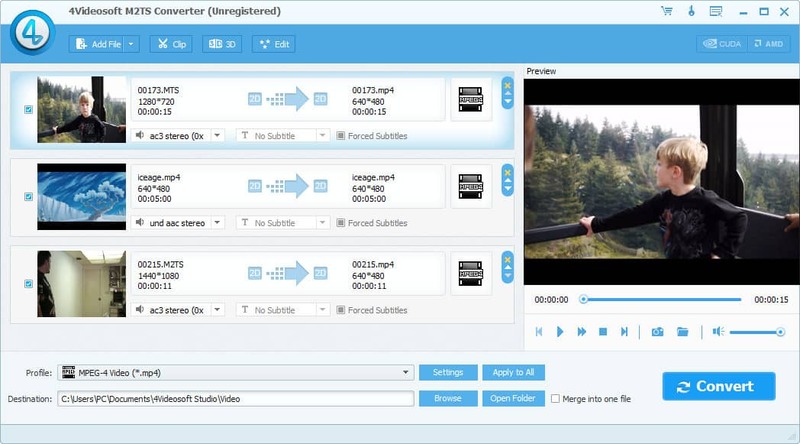 This M2TS Converter is a professional tool for video trimming, video cropping, video merging, and the versatile video editing function to optimize your video for better performance. Now it has fastest conversion speed with NVIDIA® CUDA™ and AMD APP technology. 4Videosoft M2TS Converter allows you to convert M2TS, MTS,TS etc. to MKV, MP4, PS3, AVI, etc. Besides,you also have the ability to get music MP3, AAC, ALAC, etc. from M2TS, TS and other videos, and from all popular audio formats with it. Also, the converted video and audio files can be played on iPad, iPhone, iPod, Apple TV, Samsung Galxy S4, Samsung Galaxy Note 2 and other Android/Windows devices. 4Videosoft M2TS Converter allows you to merge diffferent selected sources into one file to enjoy better. Besides, it enables you to preview the original video and output video effect at real-time. You can use this amazing M2TS converter to adjust the video effect by changing the video Contrast, Brightness, Saturation, Hue and Volume and to cut off any time-length video clips from your source M2TS.The function of croppings can help you get the perfect playing effectby removing the black edges. Add text or image watermark is also available. You can finish the whole process of M2TS conversion just with a few of clicks, so it is really easy to use. In addition,4Videosoft M2TS Converter supports NVIDIA® CUDA™ technology,which improves the file parsing speed to the utmost. Tags: • M2TS Converter • M2TS Video Converter • Convert M2TS • M2TS File Converter.